I decided to write an article about how restaurants can accommodate gluten-free diners in an effort to make things better for my fellow gluten-free friends. Time and time again, I hear from my readers that their biggest challenge is eating out gluten-free. As someone with celiac disease, I have to be careful – extra careful – when I eat out. I have to ask lots of questions and feel confident that the staff knows how to prepare and serve a safe meal for me. I know a lot of people with gluten sensitivities and autoimmune diseases are very sensitive to gluten, too, and must convey the same seriousness as someone with celiac disease. 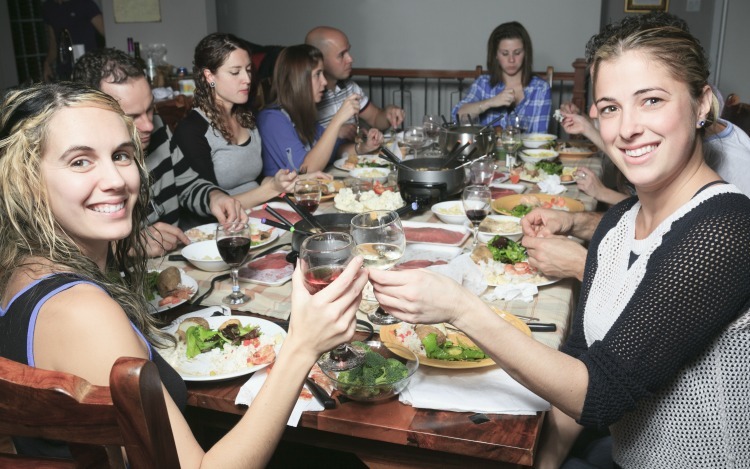 Because celiac disease and gluten sensitivities are on the rise, and more and more people are testing the gluten-free diet to see if it improves their health, gluten-free diners are something restaurants can no longer ignore, nor should they. Knowing that so many gluten-free diners need a little extra care and effort put into the preparation of their meals at a restaurant, I wanted to share five tips to help restaurants better serve members of the gluten-free community who strictly adhere to the gluten-free diet and way of life. One way restaurants can better serve the gluten-free community is to make an effort to keep gluten-free cooking utensils/spatulas, pots, pans and prep stations separate from gluteny stuff. 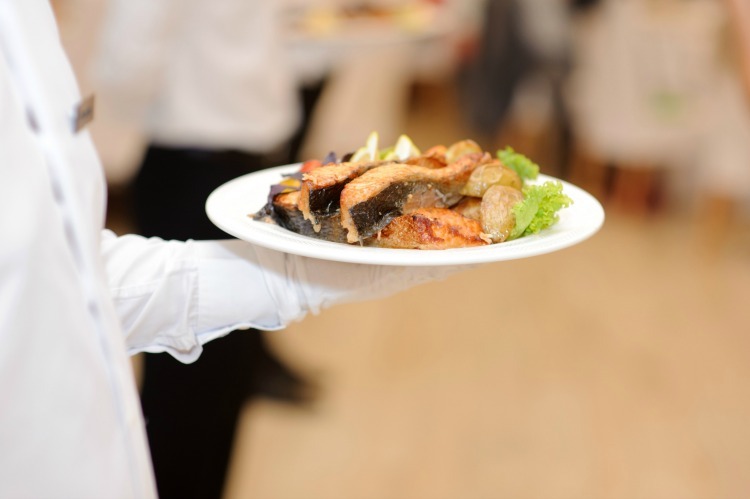 I know this can be difficult to do when space is an issue and your kitchen staff is pressed for time – but a little preparation and training will go a long way into making your gluten-free diners feel confident eating at your establishment. Color coat your gluten-free utensils and pots – or set a designated spot on your grill for gluten-free only products. If you told me that you had a separate space for preparing gluten-free meals and used a separate spatula too, I would have 100% confidence in your restaurant and become a loyal and repeat diner! While you’re at it, I highly encourage you to keep your gluten-free baked goods separate too. This weekend my family went to Milk N Cake in Denver, CO at my request after I saw a big gluten-free sign on the restaurant’s door. What I found was so disappointing. The gluten-free cupcakes that the baker took the time to make gluten-free were sitting on the shelf below the gluten-ful cupcakes. 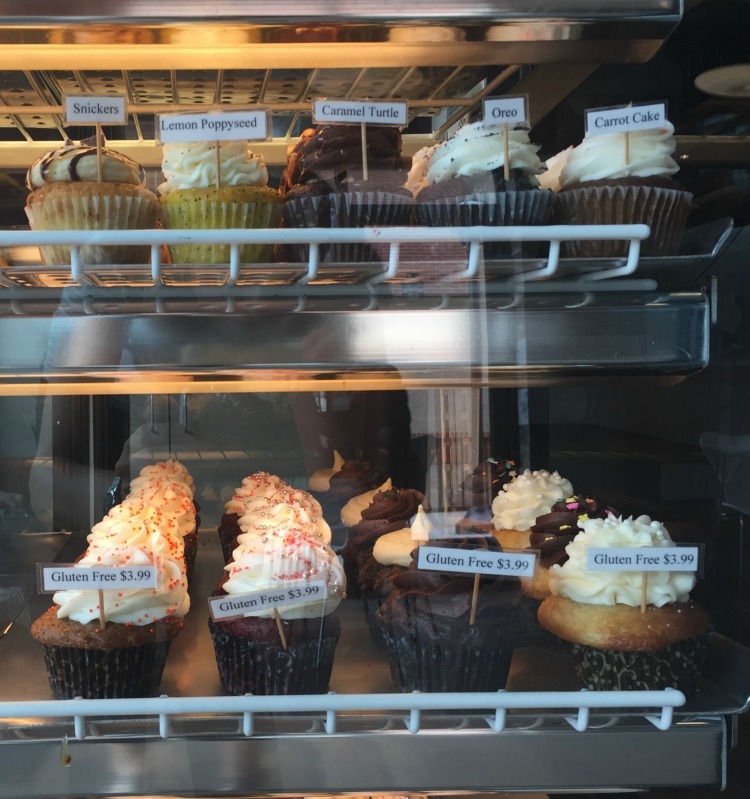 Cross contamination is stewing on those shelves and I wouldn’t eat those cupcakes – no way! I recommend keeping your gluten-free cupcakes in a completely separate area and especially not on a shelf where gluten crumbs fall on it constantly. Just put a few up for display, then tell your patrons that the gluten-free ones are hidden away in the back to prevent cross contamination. Hopefully your kitchen staff took the time to prepare a truly gluten-free meal, but then leave it to your server to mess it up on the way to the table. My “gluten-free” dish is often placed right next to or under a gluteny dish on the waiter’s tray and I can see the gluten slowing leaking onto my plate. All you have to do to avoid this is to bring the gluten-free dish out separately. It really is an easy way to make your gluten-free patrons feel at ease. I love love love when restaurants mark my meal as gluten-free, either with a toothpick label or separate colored dish. This way I know there were no miscommunications between the cooks and the servers and I have 100% confidence that the GF meal prepared in the back is the one that made it to my table safe and sound. Did you know that there’s a company that sells gluten-free labels for restaurants? It’s an easy and cheap way to add value to the gluten-free community – and the gluten-free community will reward you handsomely for catering to – and caring about – our needs too. There is nothing worse than sitting down with a group of friends to eat out than to have a waiter who is skeptical of me and my so-called “allergy.” Don’t treat gluten-free eaters like an inconvenience; rather make them feel at ease and welcome the opportunity to prepare a meal for someone with special dietary needs. 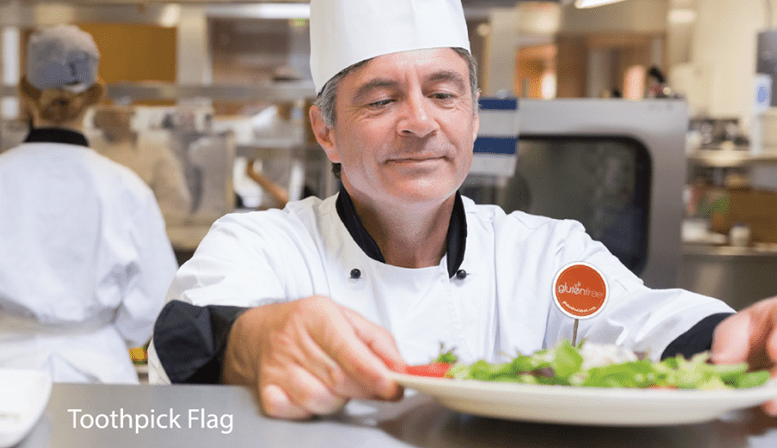 Isn’t the goal of every restaurateur and chef to make their customers happy? Also, if someone calls ahead to inquire about your gluten-free accommodations, make sure the person answering the phone can confidently answer questions about how food allergies are handled by your staff – or have them hand the phone to the manager right away. My confidence with your restaurant starts with that first conversation – if someone can assure us they can take care of our gluten-free needs and makes us feel confident eating there, we will do so. If not, we will somewhere else. I tell restaurant owners time and time again that the person with the special food needs makes the decision on where an entire group eats. In my situation, I often go out with eight, 10 or even 20 friends. Guess who decides on where we eat?!? Yep, it’s me. If you can accommodate a gluten-free dieter, then you will get his or her friend’s business that night too! Thanks for taking the time to read my tips on how restaurants can accommodate gluten-free diners and make their restaurants a little more gluten-free friendly for the gluten-free community. There are so many great restaurant owners and chains that truly care about the allergy community – but we still have a long way to go to better accommodate not only the gluten-free and allergy communities, but also the growing community at large who require special attention in the preparation and serving of their meals.